The debate over alternate fuels has continued unabated during 2007, 2008 and 2009. The number of options that are being bandied about just means to me that nobody really knows which way to turn. The technologies are all there, but there is no consensus on the way to go. So now we have LPG, CNG, E 5, E 10, E 20 and E 85 ethanol to plug-in rechargeable electric batteries and hydrogen fuel cells. Which one is the future energy delivery for the automotive world? Different countries have been leaning towards different solutions. Brazil has gone to Ethanol (including E 85), Europe is tending towards diesel and Thailand? 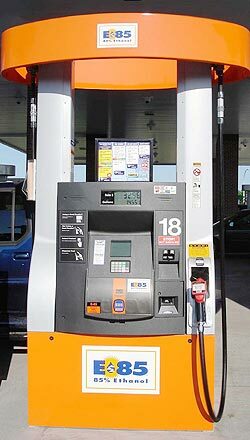 Well, we seem to be backing every horse in the race, even to the situation where PTT is promising several E 85 pumps before we have any real numbers of E 85 compatible cars. Currently I believe there is one E 85 pump in Bangkok, as I write this. So if you have an E 85 car, don’t stray too far from home. Not only are there differences between countries, but there are marked differences of opinion between manufacturers. 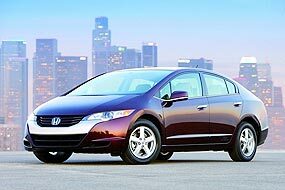 Honda is looking at hydrogen fuel cells, but admit the commercial reality is about nine years down the track. Toyota are still hybrid petrol/electric. GM are plug-in battery. What is happening is that people have become polarized (like the domestic political situation) and can only see one option - theirs! People who like natural gas promote only natural gas as if it is the savior of mankind and overly criticize all the other alternative fuels. So which one is it that can save you money and help save the planet? Some say ethanol but others disagree. “This idea that we can replace foreign oil with ethanol is madness,” says Author Robert Bryce who has written a book called, Gusher of Lies: The Dangerous Delusions of Energy Independence. Fifty-four pages of the book are devoted to what he calls the ethanol scam. He says there’s no shortage of oil in the world, so why shouldn’t the US keep using it? This whole debate is, however, nothing new. The Tribune Business News in America in Aug. 27, 1993 (16 years ago) was reporting, “As competition for an emerging and potentially huge alternative fuels market heats up, the debate continues over which fuel is superior. Agencies from Oklahoma and four other states, the Department of Energy, the Environmental Protection Agency, Canada and Mexico will meet for an alternative fuels debate Tuesday through Thursday at the State Convention Center in Little Rock, Arkansas.” Obviously that debate did not produce any real solutions way back then - just as is happening right now. Why do we (all of us motorists) need a serious competitor to oil? This would not only reduce every country’s dependence on foreign oil suppliers, but also help reduce the ability of groups such as OPEC to set such a high price per barrel. I don’t think anyone would dispute that last call! The golf courses in the desert were built by the motorists in non-OPEC countries. Larry Burns, General Motors Research and Development chief (if he’s still there) said a couple of years ago, “The best way to get the (alternate fuel) infrastructure is to get competitive alternatives to those who control it today.” He is certainly pointing the finger here at Big Oil and government. Burns’ infrastructure includes nuclear-generated hydrogen. The hydrogen exponents are still hamstrung by the lack of a good grid reticulation system, and split as to whether to use the hydrogen for fuel cell technology (Honda FCX Clarity) or using it directly as a fuel such as done by BMW and Mazda. Whereas the plug-ins have already got electricity grids supplying their houses, so new delivery systems do not need to be made. Natural gas is another energy source, but another one with reticulation problems. There is one station close to my house which has a queue every Sunday morning stretching back for up to two kilometers! The only area where all the players agree is that we should not be totally dependent upon ‘foreign’ oil. But the alternative solution still appears to be a way off, even now. However, as I wrote this item, a meeting in Australia was coming down heavily towards electric vehicles. It was being claimed that up to 40 plug-in electric vehicles - either full electric or hybrid - are being developed by the world’s motor manufacturers for launch within three years, propelling electricity to the forefront of alternative transport, according to a leading Australian authority on sustainable transport. Dr Andrew Simpson told the 2009 Intelligent Transport Systems Summit in Melbourne that electricity had already won the battle against hydrogen as the next big force in motoring, with car-makers deciding that electric vehicles (EVs) would help them to “get to zero emissions much faster”. Dr Simpson, a senior research fellow at Western Australia’s Curtin University of Technology, told the conference that electric vehicle sales would accelerate from almost scratch today to at least one million electric vehicles globally - about five percent of world car production - by 2013, and become the dominant form of car propulsion by 2030. I suggest you make sure your car-port has an electric socket! Last week, to try and bamboozle the Googlers again, I printed the following photo and asked what car it was. 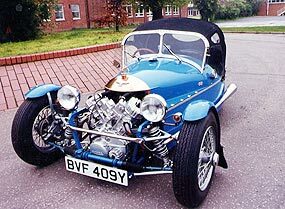 It was not a Morgan three-wheeler as everyone presumed, but was a British kit car running what I think is a Moto Guzzi motorcycle engine. The original Morgan three wheelers had sliding pillar front suspension, and not double wishbones as in this car and used a variety of engines, including V-twin engines from J.A.P. (J.A. Prestwich), M.A.G. (Motosacoche, Acacias, Geneva), Blumfield, Green Precision (F.E. Baker, Ltd., Birmingham), Blackburne, British Anzani and finally Matchless. With the appearance of the F-Type in 1933, Morgan introduced a four-cylinder engine to their three-wheelers: The Ford model “Y” E93A. So now you know! So to this week. An MG history question. What was the difference between the rear suspension on the MG TB as opposed to the MG TC? 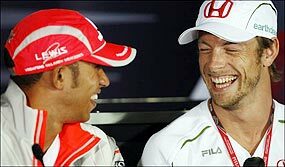 I heard from a reliable source who was at the Abu Dhabi Grand Prix, that new buddies at McLaren, Jenson Button and Lewis Hamilton asked what “security arrangements” were in place for them if they attended the post-race celebrations. Will they be smiling in 2010? Just who (or what) do they think they are? Talk about an inflated idea of their own importance! They may be ‘world champions’ in their particular branch of motor sport, but that does not mean they have some special status in the great wide world. With their obscene salaries in the multi-millions of dollars, they are confusing their salary cheques with their ‘real worth’. The above item dealing with alternative fuel sources presumes that we have the battery technology that we can utilize. Plug in, recharge and away you go. Or don’t go. I have always considered car electrics to be a black art. Take the common old battery, for example, and I am sure you have all experienced the following. You have a perfectly good battery which is just over 12 months old. In your mind that’s almost brand new. In fact, you can even remember how much you paid for it, so it must be very new. And then one morning it won’t turn the engine over. It worked perfectly yesterday, and now it won’t. You push start the car and run it for half an hour, as you suppose you must have left the headlights or even the interior light on, or something equally as explicable. Turn it off, and go to start, and hey presto! It’s still as dead as a dodo. If you are really into masochism, you then borrow your mate’s battery charger and leave it on all night. Triumphantly you remove the cables and jump in. It doesn’t work. Perfectly good one day, completely cactus the next. Explain that one, Mr. Edison. Actor Danny Dyer is usually the one on the wrong side of the law in his big screen roles, but recently he was the victim of a real life crime when thieves stole his car keys and drove away in his Porsche Cayenne. In the UK, the leading stolen vehicle recovery specialist said that 75 percent of stolen cars are taken using the owner’s keys. Dyer woke up to discover that his car keys had been stolen from his house in Loughton, Essex and his Porsche was gone. Luckily, the vehicle was fitted with Tracker’s stolen vehicle recovery device, which was activated and the Porsche was found by police in Barking an hour and a-half later. I reviewed a similar device right here in Thailand a couple of months ago, called the Tramigo, which does the same function of being able to locate your vehicle without the thieves knowing the device is installed. You can contact the principal of Tramigo Thailand (Karl) on 089 923 6845. The cost is very small compared to the loss of your vehicle, even with insurance which will only pay the so-called ‘market value’.